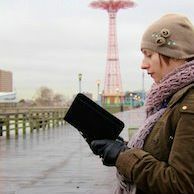 In January 2012 Morgan set up a blog, A Year of Reading the World, and, at a pace of four to five books a week, began reading, in translation, fiction, and occasionally memoirs, from countries around the world. With help from readers spread across the globe, far-reaching research and countless emails, Morgan met her challenge and got a book deal to boot. Harvill Secker will publish her book, Reading the World: Postcards from my Bookshelf, in 2015. Following is an interview with Ann Morgan about how she went about her project. Before that, you can read her list of titles read here. PP: Looking at your list, there are usually several books or more for each country. Did you actually read all the books on the list or is it a wish list? AM: The list on the website features all the valid recommendations I received for each country. At the start of the project, I asked readers around the world to help me by recommending books that I should read. I put all the valid suggestions on the list and then chose one for each country (each country name on the list links to my review for that country). Much as I would have liked to, I didn’t have time to read more than one book for each country in a year. PP: In an article for the Guardian you mention reading an unpublished manuscript. Will this be included in the book? In other words, will there be published and unpublished works? AM: I read quite a lot of unpublished manuscripts of translations for the project because there simply isn’t literature available to buy in English from every country in the world. The unpublished works won’t be published in my book – I don’t have the copyright – but I will certainly talk about the most interesting examples. PP: What were some of the biggest challenges you faced and some of the biggest surprises? Were there any preconceived notions that were shattered? AM: Getting works in English from every country was a big challenge, as was finding the time to read and blog about four books a week. Luckily, the world’s book lovers were very generous with helping me research and find the titles I needed. A group of volunteer translators even translated a collection of short stories by a writer from Sao Tome and Principe (the book was called A casa do pastor by Olinda Beja) just so that I could have something to read from this tiny African island nation because there was nothing available in English. I always knew that translation was going to be a challenge, but a big surprise was finding how many Francophone and Lusophone African countries have no literature available in English translation. I assumed that because French and Portuguese are widely spoken around the world it would be easy to find translations of books written in those languages, but there was very little. Can you believe, for example, that not a single novel from Madagascar is available in English? The country has well over 22 million people and yet people who speak only English can’t read any of its stories. I think the most powerful thing about the experience as how it made the world real to me. Over the year, the list of countries that had felt rather distant and mysterious at the start of the year became vivid and characterful. I also made so many connections with readers and writers all over the world and was amazed at the generosity of the many people I’ve never met, who got behind the project, and the enthusiasm that people showed for the idea. It was a lesson that even in our conflict-riven world, people can come together across cultural boundaries and stories can play a big part in that. PP: You’ve now finished the project—how many books did you actually read? And was it hard to finish—I imagine you get emails all the time with suggestions for books. AM: I read 197 books—one from each UN recognized nation plus Taiwan and plus one extra territory voted for by blog readers. They chose The Man in Blue Pyjamas by Jalal Barzanji from Kurdistan. It was a big challenge, but I kept on top of the reading by making sure I stuck to reading my required number of pages each day. I still get messages from people suggesting books. I hope that won’t stop — it’s lovely to hear from enthusiastic readers sharing stories they really care about. PP: Could you describe a few of the most touching exchanges you have had with readers/publishers or writers about their work? AM: I had a lovely series of letters from the Honduran writer and painter Guillermo Yuscaran. He was delighted that I decided to write about one of his books on the blog and sent me a package of postcards of all his paintings and some more collections of his short stories. He’d even drawn a self-portrait of himself on the flyleaf of one of the books. I also had a lovely exchange with the Burundian writer Marie-Thérèse Toyi. I had struggled to find a book in English from Burundi, so when a member of the United Burundian-American Community Association told me that he had been at school in Burundi with a woman called Marie-Thérèse Toyi who had written a novel in English, I lost no time looking for it. I couldn’t see how to buy the novel online, but I did find Marie-Thérèse Toyi. She was teaching at a university in Nigeria, so I sent her an email asking how I could get a copy of her book. She couriered me a copy, complete with a message encouraging me in my quest written inside the cover and we’ve been in touch ever since. PP: Has your impression of literary translation changed since you began your project? AM: Yes, I’ve come to appreciate what a skilled, intricate process it is and how vital translation is for cross-cultural understanding. It’s amazing that translators have traditionally had so little recognition. Even nowadays, it’s unusual to see a translator credited on the cover of a book. In all the 197 books I read, only my Japanese choice, Manazuru by Hiromi Kawakami, credited its translator, Michael Emmerich on the spine. PP: If you had to pick five—or ten of your favorite books, what would they be? Ann Morgan is working on two new projects, the first is what she calls a web adventure, imagining what the world might have been like if women had been in charge from the beginning of time. The second is a world bookshop challenge in which she is asking readers worldwide to send her information about their local bookshops and how many different countries are represented in the books on the shelves.